Getting ready to race smart! 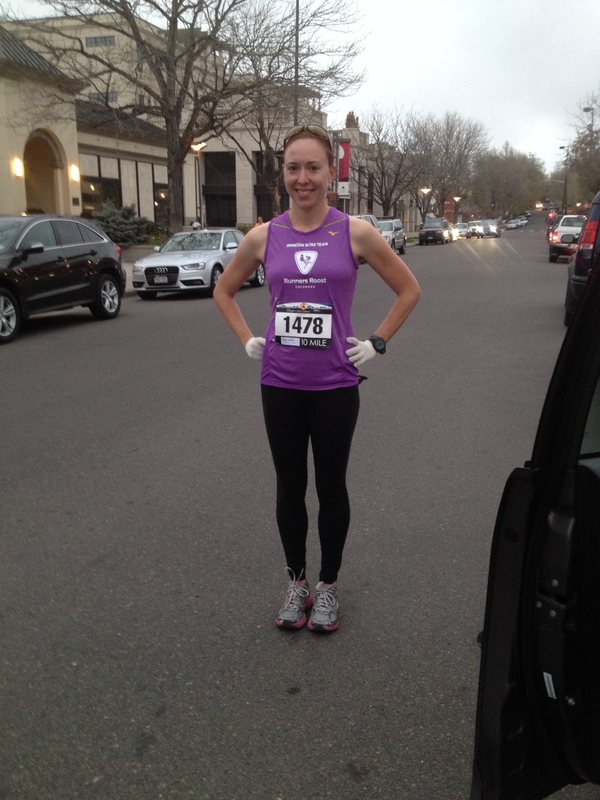 For possibly the first time ever, I felt like I ran a smart race at the Cherry Creek Sneak 10 Miler this past April. That’s not to say that all of my other races have been “dumb”, but they didn’t feel quite like this. For instance I set a PR at the last 5k I did, back in November, so clearly the race wasn’t bad, but my splits were wildly inconsistent due to starting out faster than I could handle and blowing up my legs. That’s not smart. For the Sneak my splits were as consistent as they have ever been in a race, a sign that I was racing within my abilities. That consistency not only helped me meet my time goal, but actually to beat it by a little over a minute! I was working hard the whole time but it totally felt within my capability. I was pushing but there was no fear of blowing up. There’s no other way I can describe it, but to say that I feel like I ran a smart race! Set specific goals, both short term and long- It helps to have a large goal to train for, such as a PR time at a race. For me this turns an everyday run into a specific training session, giving it more purpose and making me less likely to bail on it. It also helps to set smaller short term goals, such as what you want to accomplish for the week, as sometimes the long term goals seem so far off that it’s easy to justify not training for them in the moment. Have a schedule, and maybe even a coach- I’ve always made schedules for myself to plan out my workouts, but I tend to be general with them. Having a more specific schedule this season is keeping training more interesting and productive. It’s also been helpful to have a coach to rely on. Not only do I no longer have to worry about creating my own training schedule, but I’ve found that it helps hold me more accountable knowing I’m going to have to fess up if I bail on a workout. Don’t make your main race your first race- Plan at least one shorter race leading up to the big event. This will help you get into “race mode” and also give you time to address any fueling or clothing issues that could pop up during the main race. Train your mind, not just your muscles- I’m a big fan of visualization leading up to a race, as there are a lot of studies showing it helps improve performance and I find it makes me feel more in control of my race. The more specific you can visualize yourself attacking the course with ease the better. It also helps to pick a mantra that you want to recite to yourself during the race and to practice it on training runs. For instance, tell yourself “I feel fast, efficient, and strong”. Accept that it will hurt, and remind yourself the pain is temporary and tolerable. Know the course- Train on the course if you can, and at least spend a fair amount of time on the website looking at the map. Knowing where you’ll need to push hard and where you’ll get little breaks helps the race feel more manageable. Pay attention to your fueling and hydration- A smart race can be easily foiled by dehydration. Make sure you are hydrating and fueling appropriately for your body and the race distance. Hopefully you practiced this on your training runs also! Stay within your means- It’s so easy to get excited and start a race too fast, but it usually comes back to haunt you. Pay attention to your exertion rate and breathing, as well as your pace, and make sure you are not exceeding your abilities. Your race pace will likely be faster than your training runs, but be careful that it is not drastically so. Some people may be able to get away with this, but it ain’t a smart strategy! Lastly, practice acceptance- Not all races will be good, and that’s okay. Same with all training runs. I haven’t had a single good tempo run since my smart race. It’s frustrating and discouraging, but I’m moving on and letting go of that. Sometimes just doing the training run or finishing the race is a victory in itself. Learn from the mistakes (for instance, were you over-trained or under-trained, or was it just a bad workout? ), but don’t beat yourself up about them as it will only make you feel worse, and that’s not smart either. This entry was posted in Exercise/Training and tagged Racing smart. Bookmark the permalink.